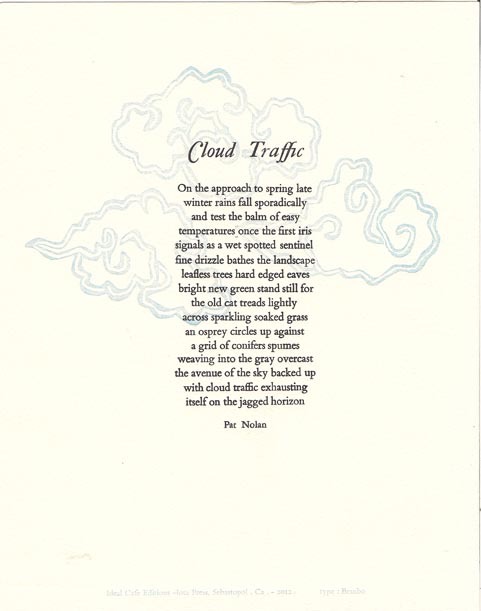 A poem and linoleum cut by Pat Nolan in a signed and numbered edition of fifty, printed in Bembo by Luci Edwards on Arches Text (6 5/8 x 8 3/4 in. ; 16.9 x 22.3 cm) from Ideal Café Editions at Iota Press Sebastopol, CA available now for $10 each, postage included, for a limited time only through Nualláin House, Publishers. See How To Order for more information.